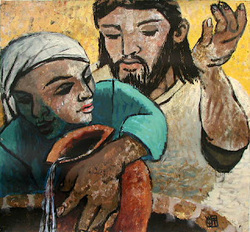 One of my favorite old bluegrass songs from Doc Watson is called “Dig a Little Deeper in the Well,” and the chorus says, “If you want a good cool drink of water, you’ve gotta dig a little deeper in the well.” All through scripture we find images of people meeting at the well to get a good cool drink of water. Usually, the encounters turn out to be much deeper than meets the eye. This month, the Imprints curriculum will focus on one of those significant encounters, as Jesus met a Samaritan woman at the well. On the surface, there were many things wrong with this picture; it flew in the face of many cultural norms. But Jesus helped the woman, and his disciples, dig a little deeper in the spiritual well, to find water that would be eternally satisfying and an inclusive community who could all share from that deep well. “Jesus Meets the Woman at the Well"
"A Song and a Prayer"